Earn up to 3,304 reward points. The ultimate analog delay pedal, bar none! Incorporates some of the same features used in vintage tape delay units. 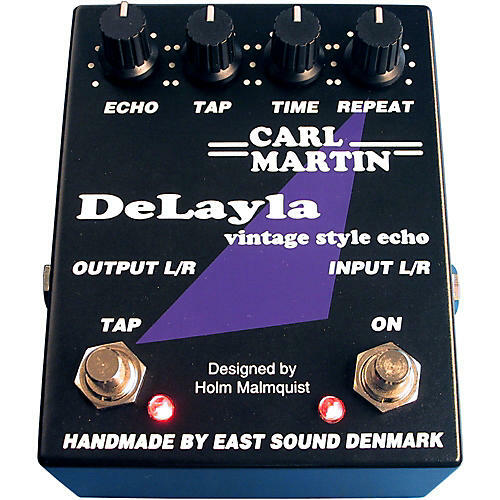 To achieve this, Carl Martin incorporated a second delay tap (similar to using 2 heads simultaneously on a tape delay). TAP footswitch turns second tap on or off. TAP knob controls the mix of main delay vs. second tap delay. Warm, smooth sound reminiscent of the vintage tape units used in the '50s and '60s. Captures one of the hardest sounds: that authentic rock 'n' roll slapback echo that digital processors are unable to emulate. Built-in, regulated (+-12V) power supply.